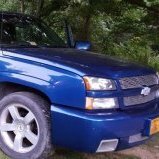 My 2003 SS engine has started dying when going down the road and i let off the gas or I pull up to a stop sign or light, I'm leaning to the throttle body being dirty and going to get started on that ASAP. Like I said the Truck is a 2003 but I only have 60,000 miles on it. It seems to be idling a little low at 650 rpms as well but it shows no codes on reader. Anything else I should be looking at?